National Grandparents Day in America is the first Sunday after Labor Day. Grandparent's Day has been celebrated in the US since 1978 and grows in popularity every year. Grandparents Day is celebrated in many places around the world and several countries even have a Grandmothers Day and a Grandfathers Day to make sure your wonderful grandparents are getting the recognition they deserve. 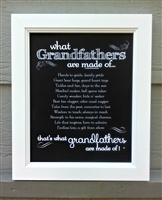 Celebrate national Grandparent's Day with a variety of sentimental gifts and framed pictures. The Grandparent's Memory Book was created to capture your grandparent's fondest memories and to share their life story. 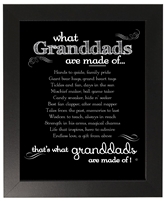 Other popular Grandparent's Day gift ideas include generation trees, poems and picture frames. Find the perfect gift for Grandparent's Day with one of our personalized frames. Show off a new baby picture, or tell a life story with a few special photographs. Our Grandparent's Day gifts are unique and heartfelt, and we hope you enjoy browsing through our collection of heartwarming gifts and find something you will truly love to give.